Headlines regarding a massive importation and burning of fossil fuels for electric power generation will certain provide grist for the mills of those who wish to disparage the anti-nuclear movement. It will be hard to argue for a cessation of the use of nuclear power generation, as the Green Party, established on Saturday, has demanded (J) in this atmosphere. In light of Japan's burgeoning LNG addiction, absolutism about nuclear power is likely to garner the mockery of the news media, the Noda government and the industrial establishment. The Green Party (Midori no to -- not to be confused with Midori no kaze, the four woman, anti-nuclear, anti-TPP caucus in the House of Councillors) hopes to run district and party list candidates in next summer's House of Councillors election. As for the next House of Representatives election, whenever it is held, the Greens hope to present a list of candidates for the proportional election, while possibly lending support to the candidates of existing and like-thinking parties in the districts. The existence of a third anti-nuclear party in the proportional voting is bad, bad news for both the SDP and LF. The SDP could conceivably fall beneath the five Diet-member limit for a party eligible for public elections funds. With Green support, however, some of the SDP members fighting for district seats might gain an edge. Unlike the SDP, the LF has enough viable candidates in the district seats that the Green Party's participation in a House of Representatives election does not pose an existential threat. Nevertheless the LF, with its opportunistic rather than ideological stance against nuclear power, has to worry about a Green Party's whittling votes in the proportional race. The LF's sizable proportional seat contingent in the House of Representatives could face annihilation. The Greens set out with significant barriers to their affecting policies in the way the party wishes. They will have a hard time fighting an image of anti-nuclear fanaticism. They will also splinter the anti-nuclear movement, paradoxically serving the interests of the moderately-pro-nuclear ruling Democratic Party and the strongly pro-nuclear Liberal Democratic Party. By the time Hashimoto Toru's Osaka Ishin no kai enters the ring, assuming Hashimoto Toru emerges from his current funk (J) and assuming Hashimoto still wishes to take on national politics after the parties in the Diet went on their knees yesterday, promising to transform Osaka Prefecture into a Metropolitan District by the end of August (J) -- and given Hashimoto's pragmatic "opposed but oh well we need it right now" approach to nuclear power --the importance of the Greens to national politics will become somewhat clearer. In Sunday's Yamaguchi Prefecture gubernatorial election, Hashimoto's anti-nuclear advisor Iida Tetsuya Tetsunari, campaigning against the completion of the Kaminoseki nuclear power station, finished a respectable second in a field of four, garnering an impressive 35% of the vote to 48% for the LDP-New Komeito backed winning candidate. Iida's second-place finish and receipt of over a third of the vote was particularly impressive given he had only been in the race for a month; had no formal organization when he started; was practically a carpet bagger (he has not lived in the prefecture for 35 years); Yamaguchi is absolutely dominated by the LDP; and a former DPJ member was one of the other three candidates running. Now interpreting the results as indicative of a strong anti-nuclear allergy, even the most conservative and public works-dependent of prefectures, might be premature. Nearly 50% of the public nationwide allies itself with no particular political party, meaning that a powerful anti-all established parties feeling already exists in the electorate. Both the LDP-New Komeito-back candidate and the former DPJ member candidates could have also been victims of an anti-MV-22 Osprey backlash, the controversial aircraft having been deployed last week to the U.S. Marine Corps base in Iwakuni. Just what percentage of votes a protest candidate like Iida would win in a national contest, when participation numbers are much higher, is at best unclear. However, it can be argued that Iida's participation likely sparked interest in what was going to be a lackluster contest, increasing voter participation. If slates of outsider candidates can lure to the polls those who would otherwise toss away their ballots, the LDP and the DPJ, but particulary the DPJ, will be in serious straits. The Noda government's rollout of the Oi reactor restarts was a fiasco, energizing as if with a lightning strike the previously somnolent anti-nuclear movement. All the DPJ, even those favoring a nuclear phase-out, are tarred with the brush of the Noda government's impossibly quick determination of the safety of the Oi reactors. So what will be the color of the revolution, or at least this iteration of it? Much later - Many thanks to reader MP for his alert reading of this post. Is That What We Have Decided To Call It? The rule of thumb is when katakana eigo is used for a new term, it is with the goal of letting elites to speak to other elites, excluding the common run of humanity. This is doubly so in this case where the transliterated English term is used to purportedly explain the kanji+kana term. This was in reference of the report's usage of the English word "mindset," transliterated into Japanese (maindosetto) and then used as the explanation of a perfectly good Japanese term (omoikomi). It is true I am not a native speaker. As a consequence I do not get an automatic pass on the validity/dubiousness of my ideas. I have to present evidence. "There are, as we had in our little debate earlier regarding the mai namba, many different related points. Or, that we have to quickly set up of the People's Consultative Body and such things -- these too exist. Yes, the fundamental reforms of the pension and social welfare systems, but aside from those, bills other than the fundamental reforms, various other big bills are left, such as the special bond issuance bill. For this and bills like it, I believe it my responsibility to see them through." What caught my attention here, aside from the bald inference "You think I am going to call a snap election after the passage of fundamental reforms of the pension and social welfare system? Keep dreaming...." was the mai namba. Now I am a native speaker of English, so I know that mai namba is a transliteration of "my number." Since I am not always on top of the latest euphemism, I confess I had a moment's confusion. Then I thought, "Oh wait, if I wanted to keep folks from getting riled up about their being assigned a tax identification number (zeikin kanren mibun shomei bango) and were not confident enough even to semi-cloak it in a social welfare gauze (shakai hosho -- zei bango*), would refer to it with friendly, personal-sounding and foreign-language moniker. 'It's My Number. Mine. Just for me! Yippee!'" As for what the assignment of a mai namba will do to improve the government's ability to claw taxes from out of the populace, contact Richard Katz. * The current technical term for the number. Someone writing about Chongryon (in J. Chosen soren). Neat! It's been a big couple of weeks for North Korea's 29-year-old dictator. Kim Jong Un appointed himself titular head of the country's military last week and took his marriage public on Tuesday. But amid the celebrating, Kim's Stalinist regime suffered a little-reported setback on the other side of the Sea of Japan. At a time when North Korea is as desperate as ever for hard currency, one of its few reliable generators -- and one of its few links to the outside world -- has gone broke, likely ending the bizarre but significant half-century history of Japan's once-formidable North Korea lobby. The author talks to Kong-do Oh, who is as knowledgeable a person as there is about what has gone on in North Korea, what is going on there, and about those who have either escaped from or are passing in and out of that country. The author talks to Michael Green, getting Dr. Green to wax anti-Liberal Democratic Party over the Tanaka-Takeshita Faction's embrace of the DPRK and its Japan-based operatives and operations. - claim that Korean residents of Japan suffer discrimination even today, offering as evidence an inoffensive but informative Minoru Matsutani article on the new foreign registration law (E)? The Matsutani article makes no a claim of discrimination, unless you consider the convenience of going to the local ward or municipal office for one's new foreign registration card, as the non-naturalized have always done, discrimination. Of course the law discriminates, but not in a pejorative sense. - state that Koreans of the two nations of the Peninsula make up the largest group of foreign residents of Japan? That status belongs to the Chinese (J). This has been the case for several years now. - provides as a reference for Chongryon's use of pachinko parlors as as main funding mechanism a page from an aggregator "Japan stuff" website that does not even once make such a claim? What there is on the linked page is a further link to the website of an anonymous British blogger who makes this claim, without supporting evidence. - quote the English-language page of a North Korea friendship organization as the source for numbers of Chongryon's members at the height of the organization's wealth and influence? The fall of Chongryon over the government's bailout of its credit unions should be a fascinating tale. However, this is not the article to read about it. How this rubbish slipped past the editors at The Atlantic is beyond me. Later - The need to run an errand prevented me from noting the caption to the seven-year old file photo accompanying the article. You will love it; I am sure. Just click on the below image for a larger view. The operatically minded have to ask: what has made Rosen so cavalier? Is there not anything the voracious sportsmen and sportswomen of this blessed land will leave unto others to excel in? "The Poverty of Japanese Politics"
Forgive me if I have not said it before, but the EAF continues to be the go-to site for thought pieces on Northeast, Southeast, South and Central Asian politics and economics (Link). We all need to thank Dr. Peter Drysdale and the Australia National University for founding and maintaining this outlet for up-to-date and varied analyses of the major issues facing this vast region, particularly moves toward greater integration and cooperation. A lot of really weird stuff has been happening in the DPRK of late -- press availabilities at supposedly super-secret rocket launch sites, non-testing of atomic devices, the reinvitation of Kim Jong-il's Japanese chef back to Pyongyang, the unlicensed Disney characters dancing and projections of scenes from Rocky movies at televised concerts for the elite. (E). All this weirdness keeps the folks who write for 38North very busy. James Church, for example, has written a very helpful post arguing that the word to look for in any current statement coming out of the DPRK is "belt." 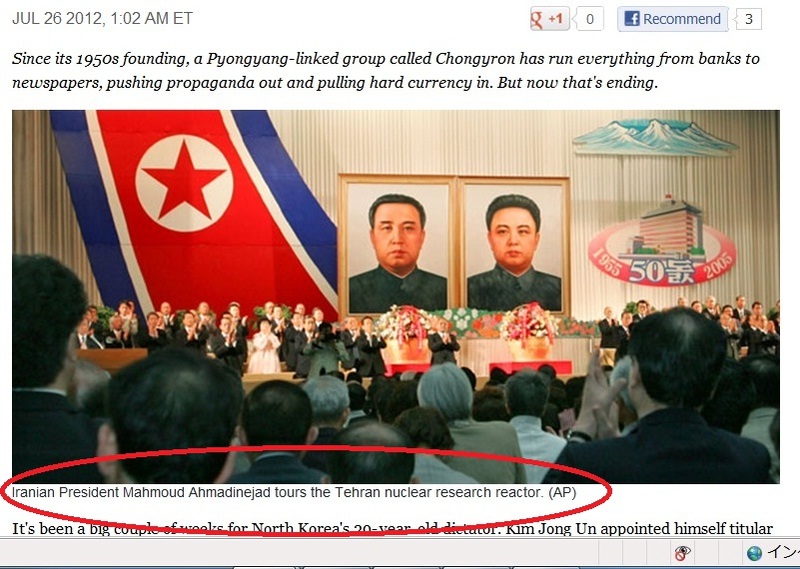 Little do I know about the DPRK and the ins and outs of Pyongyang. However, this I do know: the Kid is not North Korean. Whatever it might say on his current official DPRK passport, if he has one, North Korean is not his true nationality. He is, for all intents and purposes, Swiss -- having seemingly spent almost his entire life in that country. To expect him to make an about-face and really dig being the evil dictator of a dirt-poor, culturally deprived, enemy-of-all-humankind rathole does not make much sense. Note how quickly the leadership has found him his Lady Diana, whom we can assume is from a family with impeccable political credentials, is not the brightest bulb in the chandelier, is presumed fecund and is likely schooled in certain arts to keep him...occupied (E)...lest he become annoyed with the Confucian monarch routine after growing up in the land of cuckoo clocks, chocolate, cheese, skiing and UBS. Later - The sharp-eyed and knowledgeable have nailed down the newly-minted missus as being a much-touted singer and former member of the DPRK cheering squads (J). The leadership have thus provided the Young General with a spouse who knows how to charm and perform and who has not the least doubt about the rightness of the regime. For all those who believed that Osaka City mayor Hashimoto Toru would take the punch to the gut of the revelation of a 2006-08 affair with a bar hostess with scarcely a break in his stride, it is now been eight full days since the Opinionated One has tweeted on his Twitter account. Today we have news of the notoriously judgmental Hashimoto will be giving those whom he previously disparaged a second chance. In 2008, during his term as governor of Osaka Prefecture, Hashimoto, Osaka native though he is, attended his first bunraku performance. "I will not go a second time. If the performers don't change and start responding to the demands of the audience, I cannot accept (the Bunraku Kyokai's application for public support)." And freeze public funding for the association he did, when he became Osaka City's mayor. However, yesterday, Hashimoto let out that he will be attending a second performance of the bunraku tomorrow (July 26) -- on the grounds that he had heard that the bunraku artists had made significant efforts to promote the art form and increase attendance, such as standing outside of railway stations inviting commuters to become patrons. It seems that for the new, more humble Hashimoto, a solid effort to do better is good enough to make him break a vow. I do not expect...but heck, there is always hope...that the giri versus ninjo conflict therein gets him thinking about his own situation in a new light. In my post of yesterday, I asserted that for a Liberal Democratic Party-sponsored no confidence motion to pass, LDP president Tanigaki Sadakazu would have to round up every member of every one of the opposition parties, all of the independents and then 17 members of the Democratic Party of Japan. Alert reader RK asked in an email: "Are you sure 17 is the correct number?" Interestingly, the news media in recent days have not posted any hard numbers on exactly the number of ruling coalition defectors the passage of a no-confidence motion would require. The number, however, is certainly not 17, save under a special case of a specific number of Representatives abstaining. There are 480 seats in the House of Representatives. At present one of these seats is empty, meaning their are 479 representatives. Furthermore, the Speaker of the House, former DPJ member Yokomichi Takahiro, does not vote, except in the case of a tie. So the number of voting members will be 478. Half of that number is 239. For the motion to pass with all members voting, those in favor must number 240 (50%+1). The ruling coalition is composed of 250 member of the DPJ and 4 members of the People's New Party. With 254 in the ruling coalition, Tanigaki would have to lure 16 of the ruling coalition (254-16 = 238) into voting for the no-confidence motion. However, the chance that everyone will be present and voting is unlikely. The Communists (9 votes) will likely abstain, as they are wont to do (Then why are they even in the Diet at all? Heck, I do not know). This would raise the bar to 20 defectors (469/2 = 234.5, 50%+1 = 235, 254-20 = 234). Of course, members of the ruling coalition could abstain, lowering the number of defectors needed. Indeed if all 17 of the DPJ Representatives currently under suspension for having voted against the legislation raising the consumption tax abstained, and all the members of the opposition voted for the no-confidence measures, supporters would only have to lure 6 members of the DPJ to switch sides, (478-17 = 461, 461/2 = 230.5, 50%+1 = 231, # in the opposition + independents = 225). As the math indicates, however, a significant slice of DPJ legislators would have to be sending clear signals on their giving up on the party and the LDP would have to be exercising strict discipline over membership of the rest of the House before Tanigaki could entertain a hope that a no-confidence motion could pass. The LDP, a cautious, even timid organization, does not move on hope alone. So the while the idealized minimal number of defectors is 16, the actual minimum is fluid, and the ability to round up the correct combination of defectors and abstainers ostensibly beyond the capacity of the current opposition. 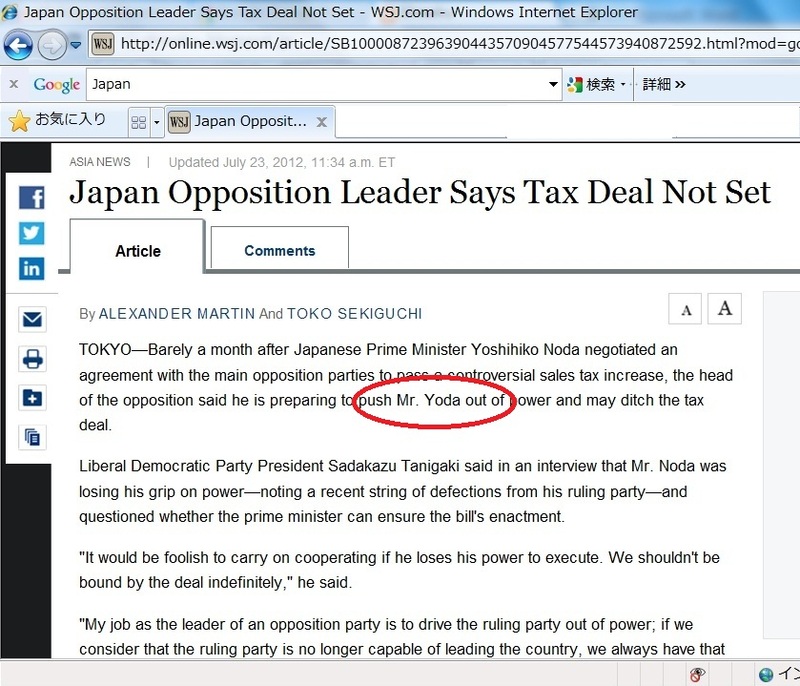 - If Prime Minister Noda Yoshihiko, in an attempt to prevent further defections from the Democratic Party of Japan's House of Representatives or House of Councillors delegations, proposes modifications of the bill doubling the consumption tax in FY 2015, then the deal in between the DPJ and the LDP-New Komeito alliance is off. - Tanigaki is ready to submit a no-confidence motion against the government in August. What could be compelling the president of the LDP to talk to foreign financial information wire services? Was he just going the rounds, talking to anyone who could schedule an interview with him? Seemingly not. A cursory look at the domestic press shows him offering no interviews to a domestic news entity, just a press availability open to everyone on the 20th. The first point Tanigaki raises is trivial: a deal's a deal. The PM is not stupid -- he knows that if he tries to renegotiate the package on the passage of the pension and social welfare bills through the House of Councillors, the LDP and the New Komeito will cry betrayal, and order their senators to vote against the bills, killing the reforms. The second point raised is non-trivial -- and gives an indication why Tanigaki chose to spend his time with Bloomberg and ASW-A rather than any major domestic news outlet. Tanigaki faces a huge battle to retain his position, should he choose to present himself as a candidate in the LDP's presidential election in late September. He has taken the party absolutely nowhere in three years in office. The party's public support numbers are below those the party had after its trouncing at the polls in August 2009 -- though, to be fair, the LDP does rather better when the question asked is: "What party will you be voting for in the proportional seat vote for the House of Representatives?" Ambitious colleagues in the party know that Tanigaki's election to the presidency was not due to any outstanding qualities he possessed, but merely because out of the princes of the factions, it was Tanigaki's turn on the throne (I am indebted to Okumura Jun for this insight). 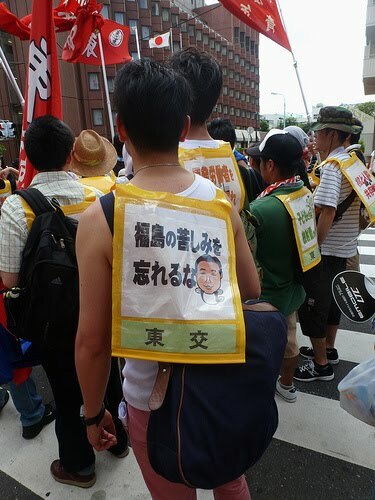 The domestic news media is aware of the tenuous hold Tanigaki has upon the party rank-and-file. They know that if he cannot engineer a political crisis before the end of the current Diet session on September 8, he will go down in history as only the second LDP president to not become Prime Minister. What the domestic news media also knows is that Tanigaki has virtually no ability to precipitate a political crisis of the magnitude capable of toppling the Noda Cabinet. He cannot bring down the government in this session over the bond issuance bill: the government has enough money to last until October, or beyond, with a little fiddling. As for a successful no-confidence motion, Tanigaki would have to round up everyone not in the governing coaltion -- every member of every party and every independent -- plus 17 of the DPJ's own members, to vote with the LDP (the numbers work out differently, of course, if there are abstentions). This means the Communists voting with the LDP, something that might happen, oh, immediately prior to a giant meteor hitting earth, extinguishing all life on the planet. It means the LDP joining hands with Ozawa Ichiro's People's Life First Party (LF). The LDP has a strong wish to return to the position of the party of government and strict internal discipline. But grab Ozawa's hand, after all the many times he has scalded the LDP? The very thought sets the brain to boiling. - "How are you going to get the Communists into bed with you?" - "What if you entice the requisite number of number of traitors to vote with you and your allies against the government? Then what do you do? The electoral districts are still unconstitutional, so a Diet dissolution and elections are illegal. What kind of coalition are you going to put together to solve that problem, after you have blown the DPJ apart?" Better to talk to the international financial press, to sow confusion in the international markets and foreign institutions, first in the hopes of sparking questions about the stability of the Noda government, and second, through the Japanese media's peculiar obsession with the way Japan is portrayed in the non-Japanese media, a rebound of the story in the domestic press. Because after a serious bout of political deafness over the U.S. Marines' introduction of the despised MV-22 Osprey aircraft into this blessed land (J), one which made it look as if the intransigence of the U.S. Marines was going to drive a second DPJ prime minister out of office, the PM has righted himself and is demanding safety assurances and interim flight paths guaranteed to drive the U.S. Marines nuts. This is perhaps not the "Return to Sender" message the public wants the PM to send to the United States. However, it represents a significant step in the government at least appearing to reclaim sovereignty over the nation's airspace, which Noda for a moment seemed to be giving away. Tanigaki needs Noda to misread another issue, or have a member of the Cabinet get caught in a compromising position, to evade the axe in September. Without Noda's or the Cabinet's help, Tanigaki is doomed. He will talk up a storm but he has no wind at his back. It was a typo just begging to happen. Congratulations Wall Street Journal Asia, you win the coveted LGM (Little Green Men) Award. On Friday, former (thank Amaterasu) prime minister Hatoyama Yukio showed up in front of the Prime Minister's residence to show his support for the Friday evening anti-nuclear protests. Hatoyama and Social Democratic Party leader Fukushima Mizuho -- the woman he fired when she would not approve his repudiation of his campaign promise to move the U.S. Marine Corps elements currently at Futenma to a location outside of Okinawa Prefecture. Honestly, this man should be behind bars, not out on the streets. During his premiership, his immediate underlings were discovered to be running a criminal enterprise, converting, through thousands of false transactions, taxable gift mountains of cash from his mother into bogus, non-taxable political donations, some, mysteriously and remarkably, from persons no longer living. Ozawa Ichiro is roasted over the coals, and continues to be roasted over them, over a single loan he made to his own political organization where no taxes were evaded nor no illegal profits made. Hatoyama gets to pay the back taxes on the gifts (600 million yen's worth of back taxes), his underlings get prison terms and he walks away scott-free. My bad if I misunderstand the legal niceties involved, but was there not a requirement to investigate what Hatoyama knew and when it was that he did know it? * "Go Home! We don't need political maneuvering!" ** "Go Home! King of the Heisei Era tax evaders!" The Japan Times had a long conversation with me a while ago, the result of which appeared in the print and online editions (Link) of the paper yesterday. The online version is about twice the length of the print version, which means, depending upon one's tastes, either double the fun or triple the tedium. And yes, the word is "abnegating." Over at Japan Security Watch and the search-engine-optimization-hostile σ1, Corey Wallace takes a grand tour of East Asia and the pitfalls looming in the massive wave of government changeovers this fall. Mr. Wallace hedges in his final paragraph, describing the post's viewpoint as as "mostly cynical." You can relax, Mr. Wallace: no one has ever lost any money on "mostly cynical" -- ever. This Sunday's morning talk show lineup provided a stark demonstration of the depleted state of this blessed land's politics. Following a week of significant action -- the defection of four more members of the ruling Democratic Party of Japan and the consequent formation of two new parliamentary caucuses in the Diet and even more more in the local assemblies (J - Yamanashi and J - Tochigi); the public humiliation of Ambassador to China Niwa Uichiro, the first non-bureaucrat to hold the post, over his matter-of fact assessment that a purchase of three of the Senkaku Islands by the Tokyo Metropolitan Government would likely lead to great frictions in between Japan and China (E - When will the Government of Japan get around to issuing the "It's OK talk to anyone -- ANYONE -- just not the Financial Times" directive? ); the first serious hiccup in the seemingly unstoppable march of Osaka City mayor Hashimoto Toru (for those keeping score: July 21 = 0 tweets) -- the best that Nichiyo Toron, the national broadcaster NHK's flagship political debate program could come up with was a debate in between Jojima Koriki and Kishida Fumio, the Diet Affairs chairmen of the DPJ and the Liberal Democratic Party, respectively. For 22 minutes, rather than the customary hour. And with Kishida not even in the Tokyo studio but piped in from outside. This is nearly unprecedented. Nichiyo Toron almost always has at least the policy chiefs of all the major and mini-parties of the Diet on display, if not the party secretary-generals. True, the result looks ludicrous, with the representative of the ruling DPJ and the representative of its coalition appendage the People New Party on one side facing off against six (now, with Ozawa Ichiro's new Livelihood Party, it would be seven) representatives of the main opposition parties on the other, requiring the moderator to carry out a delicate dance of traffic control in between the criticisms of the opposition and the assertions of the ruling coalition and in between the positions of the significant parties and the sad bleatings of the insignificant. These five subjects are all linked together as in a chain: the solving of one leads to and depends upon the solving of others. As the sparse attendance at Nichiyo Toron debate indicates, these are issues the DPJ and the LDP have to work out between themselves, as no combination of either party with any of the other parties in the Diet can approve any of the necessary legislation. The greatest hurdle is an agreement on the reform of the House of Representatives. At present, 97 districts have populations greater than 2 times the population of the smallest district, meaning that over half the votes in those 97 districts are essentially thrown away. Despite a history of deference to the executive and legislative branches, the Supreme Court has thrown down a challenge, declaring any disparity greater than 1.99 to 1 unconstitutional, putting some meat on Article 14 of the Constitution, which guarantees citizens equality under the law. The LDP bill, known as the +0/-5 Solution, is a clever response to the Supreme Court's challenge. Rather than giving the voters in the 97 grossly underrepresented districts a greater say in the running of their government, the bill would simply abolish the five smallest districts. The disparity of between the 97 largest districts and the smallest district would then fall below the 1.99 limit. The attraction of this bill for the LDP is obvious. It preserves almost intact the inequalities that perpetuated LDP rule for 50 years. The urban and suburban, revenue-producing districts are denigrated, while the largely rural districts, with their government contract- and regulation-protected economies, are elevated. The competing DPJ bill has as its core the +0/-5 Solution, which is contrary to the interests of the DPJ's natural constituency, the abused urban and suburban electorate. Tacked on to the +0/-5 core, however, are a pair of amendments that at once entice and repel the New Komeito, the LDP's alliance partner. The DPJ bill is thus not a bill at all. It is a red herring, a lie told in order to keep the LDP and the New Komeito engaged, under the illusion that a weakened DPJ is ready to cut a deal on redistricting. In return the LDP and the New Komeito, out of their present eagerness to hold an election, are expected to offer concessions on pending bills, such as the all-important bond issuance bill. However, all the gamesmanship cannot disguise a basic reality: the DPJ and the LDP no longer have the luxury of playing ruling party versus opposition. With the recent defections of 16 House of Councillors members, the DPJ no longer has the option of teaming up with the New Komeito to pass bills through both Houses of the Diet. Only a DPJ-LDP consensus can guarantee a bill's passage. Furthermore, as Okumura Jun has noted, barring the intrusion of a Hashimoto Toru-led national political party -- which, due to this week's revelations and Hashimoto's sudden loss of his voice, suddenly has become far less of a threat to the status quo -- there is no plausible set of election results altering the necessity of DPJ-LDP cohabitation. An election, if held today, would not prove or solve anything. Furthermore, the LDP membership does not really want to have an election, not now. Party president Tanigaki Sadakazu has proven a disappointment, unable, since his election in 2009, to improve his party's standing with the electorate, despite the DPJ's many stumbles and bumbles. Tanigaki's term ends in September; several of his more aggressive and thoughtful colleagues are poised to replace him. Eager to force an election before his term runs out, Tanigaki advocates implacable confrontation with the DPJ. His intra-party rivals, unwilling to undermine the authority of the party presidency that they themselves covet, echo his intransigence, though with a distinct lack of enthusiasm. Hence the current poverty of Japanese politics. While a multitude of decisions await, the direction of the country is hostage to the passage of a handful of bills. Furthermore, a faith that party identity is honed through conflict with the other side, a legacy of the LDP's long reign in power, holds the two major parties back from inescapable collaboration. As regards the affair Hosono Goshi had with Yamamoto Mona, which has in no way impaired Hosono's career -- indeed, a few of the weeklies have annointed Hosono as the man most likely to succeed Noda Yoshihiko as prime minister -- there was one more reason the news media chose to gang-tackle one of its own rather than the straying, handsome young politician. Yamamoto, aside from having been at the time single, a TV personality, young and beautiful is only half-Japanese, her father being...gasp...a Norwegian sailor! Yes, there is nothing that quite says out-of-control, hot-blooded sexual predator like "Mona Hegdal" -- her birth name. As for Mona-san, who went through months of being batted around like a ping-pong ball dropped on a floor covered with mousetraps, she seems to be doing all right. It may be just one long "just-so" story...but what a story! Keio University professor Oguma Eiji offers The Asahi Shimbun's English-language AJW a rollicking, wide-ranging take on what's going on (Hurry up and copy, before link rot sets in). Yes, Oguma's old university home page was way cooler. On July 18, Shukan Bunshun printed a full-documented article (an oddity, for the publication) revealing the existence of sexual relationship between Osaka mayor Hashimoto Toru and a bar hostess since 2006. Unfortunately for Hashimoto, he had married his longtime live-in girlfriend Noriko in 1995, making his sexual relationship with the bar hostess an illicit affair. Now Hashimoto's ability to escape damage to his image from the revelation of the affair could be helped if his marriage could be categorized as, to put it delicately, unfulfilling. However, in between 1997 and 2007, Noriko gave birth to 7 children -- which, given suppressed fertility during lactation, is evidence of nearly uninterrupted "good relations" from 1996 to 2006. To those who would dismiss the matter, noting that many other politicians have had affairs exposed with little effect on their careers, I would offer the proposition that times have changed. True, Hashimoto has claimed to be a poor father, if not poor at fathering -- though he perversely won a "Best Father" award in 2006 -- the year he began his affair with the hostess. Hashimoto's his most famous quote on his parenting skills is: "Without my wife present, my limit of my being with the kids is about 30 minutes." His rubbishing of his fathering skills (which his wife has echoed, saying, "What could I possibly have to tell you about his childrearing?") is one thing, abandoning his pregnant wife for a fling with a bar hostess will hurt him and his Ishin no kai with women voters, who make up at least half of his and his organization's supporters. In general, hypocrisy does not wear well on lawyers, particularly ones who have made a career out of calling out others for their hypocrisy and stupidity. How serious does Hashimoto think this story affects his public image? One measure is the extent to which he has clammed up since the Shukan Bunshun article has appeared. When Japan's most opinionated and possibly arrogant self-made man shuts up, he is telling you something: that he at least thinks himself in the deep bat guano. Later - The Japan Times article on the scandal revisits Yamamoto Mona's affair with the married Hosono Goshi (E). The scandal did nothing to dent Hosono's standing within the Democratic Party of Japan. Hosono is indeed now the serving Minister of the Environment and the Cabinet's point man on the Fukushima nuclear accident. Hosono's being able to shrug off the affair was aided by the popular depictions of Yamamoto, at the time a TV news reader and single, as having been the aggressor in the relationship. This is more a ransom set of notes than a post. The central government's prososal to nationalize the three islands, and indeed the Ishihara-proposed TMD purchase, violate the fundamental principle of Northeast Asian peace: do not try to solve anything. No matter how twisted, frustrating and dangerous a situation, the cardinal rule is "Don't touch it"-- as any attempt to rationalize a situation instigates nationalist explosions. Michael Auslin has recently published an opinion article on the Senkakus, "Japan Feels a North Asia Squeeze" and Stephen Harner has blogged on the subject "The Japan-China Territorial Dispute is Serious, and Escalating." Both authors make claims that do not stand up to scrutiny. Auslin claims that declining U.S. power projection in Northeast Asia has left Japan vulnerable to pressure from China and Russia, and that if Japan should walk back from a hardline stand now, that its neighbors will make even more demands of Japan. First, the recent visits by the president, now prime minister Dmitry Medvedev to the Northern Territories do not represent an escalation of demands on Japan. Russia has effective control of the Northern Territories and has had it since 1945. What Medvedev's visits have tried to do is whip up a fear of a military reconquest of the Northern Territories by Japan's Self Defense Forces. Making such an absurd claim is a measure of the Putin government's desperation to simultaneously justify Russia's current borders and to bolster an expansive Russian identity. As for China's putting a squeeze on Japan, it is due to China's expanding military reach, which no one, not even the Obama Administration and its pivot to East Asia, can do anything about. While China's PLA Navy is not directly involved in the current provocative actions in and around the Senkakus, the PLAN is the big stick looming behind the increasingly bold tests of the Japan Coast Guard's resolve to halt unapproved fishing in the area and the swings through the contested zone by Chinese fisheries vessels ostensibly keeping tab on the actions of China-based fishermen. Japan seems compelled to force the issue with China, while China would very likely be satisfied to live with the status quo, as long as Japan would acknowledge that it too has a claim on the islands and surrounding area. While the first part of that statement is true -- that the government of Japan feels compelled to force the issue with China, due to the imminent danger of a radical nationalist coming into at least nominal control of the islands (and achieveing the ability, should the procedures of the past be followed, to extort extraordinary rent from the central government at the time of the renewal of the annual lease) -- the remainder of the sentence is poppycock. First, China is an outlier of the 21st century. It is the only country in the world seeking to reestablish the imperial reach it possessed at the zenith of its power at the beginning of the 19th century. Every one of the rest of the world's imperial powers has receded, even the United States, which despite its messianic missions of the last few years, has no capacity or desire to hold on to the countries its troops have invaded and occupied (one can argue that the expansion of NATO is a soft form of imperialism but since participation in that organization is voluntary the argument does not hold water). That the government of China should be seeking to nail down ownership of the lion's (tiger's?) share of the South China, East China and Yellow Seas, as well as obliterate the ancient semi-independent Uighur khanates and the Tibetan kingdom, demonstrate an anachronistic national purpose, based on a spurious "humiliation" of China from the Opium Wars onward (You want to talk about national humiliation? As the British and the French about the Suez Crisis). Second, how can Japan admits that China has a claim on the islands and surrounding areas? It would lose all ability to claim legitimate control of the Senkakus. China does not accept Japanese claims on the islands and surrounding areas, for precisely the same reason. Mi casa es su casa? Not if you want it to remain mi casa for very long. Stephen Harner is a former U.S. diplomat, Japan-based business executive turned China-based business executive and now a Japan-based consultant. He blogs for Forbes Magazine at http://blogs.forbes.com/stephenharner/ (the link in the blogroll is Whither Japan). For outstanding -- and I mean eye-wateringly good -- analyses of Japan issues for free, one cannot do better than the researchers at the Institute for Defence Studies and Analyses (IDSA) in New Dehli. Their "Comments" are works of outstanding scholarship. The latest one on Japan, "Political Rift Deepens in Japan over Senkakus’ Nationalization," is available here. Note that all the references within the comment are to articles the domestic press; none from non-Japanese sources. Nobody else does that, not even the truly excellent folks at the Congressional Reference Service (CRS) -- who, to be fair, have to answer to U.S. congressmen and their staffs who may have read something in the New York Times or Stars and Stripes. And now, a bleg. Will the graduate student who is blogging his readings of the Big Books on Japan with the word "Heian" in the title line of his blog please contact me, so I can add your blog's name to the blogroll? In my post of yesterday, I was puzzled what Nakatsugawa Hirosato, a Tokyo Bloc proportional seat representative of the Democratic Party of Japan could be doing quitting the party to serve as an independent. It turns out the answer depended on what one believes "independent" means. If by independent one thinks "serving in the Diet without attachment to any party" then Nakatsugawa's resignation yesterday made no sense. If, however, by independent one means "a label to paste upon oneself until the party one hopes to join organizes itself" then a proportional seat member throwing himself off the DPJ party list before the party got around to throwing him off itself makes complete sense. As it turns out, Nakatsugawa seems to be the missing piece in the plans of Kiuchi Takatane, the first man out the door in the buildup to the passage of the consumption tax bill. Kiuchi, the Tokyo District #9 seatholder and a former Merrill Lynch partner, is The Big Money behind a new parliamentary caucus in the House of Representatives, just as Tanioka Kuniko is The Big Money behind the new Green Wind (Midori no kaze) caucus in the House of Councillors. Kiuchi, it turns out, is further along in the process of building a party around himself than Tanioka. Nakatsugawa, if and when his resignation from the DPJ is accepted, would become the fifth member of the Kiuchi's new caucus, currently slated to be called "the Association of Reform Independents" (Kaikaku mushozokukai) (J). With five members the caucus could be converted into a formal party, eligible for public campaign funding and other goodies. The caucus, which is to be launched today without Nakatsugawa's participation, is composed of Kiuchi, a North Kanto proportional seat holder, a South Kanto proportional seat holder (Nakatsugawa, if and when he joins, would complete a Kanto Plain trifecta) and Sato Yuko, a Nagoya District seat holder and former political secretary to current Nagoya City mayor and major loon Kawamura Takashi. So on successive days the DPJ has seen defections tied to monied former members, both of whom were recruited by Ozawa Ichiro, each establishing proto-parties linked to neither the DPJ, the LDP nor Ozawa Ichiro's Livelihood Party. It is impossible to tell how far either Kiuchi's or Tanioka's caucuses can go. Neither Tanioka's liberal (don't tax but spend) or Kiuchi's neo-liberal (don't tax and don't spend, indeed, cut) ideologies electrify the electorate. Tanioka is an irrepressible talker, so will have no problem in promoting Green Wind and keeping it in the public eye. Kiuchi's communication skills are so far unknown. Kiuchi's focus so far on the Kanto Plain area, where Watanabe Yoshimi's Your Party has its base (and indeed, featuring a political philosophy which is nearly indistinguishable from Watanabe's), and Tanioka's only having women in her caucus are hurdles both incipient leaders will have to overcome before either caucus can become a significant new forces in politics, both which in their essences seem to be competing flavors of Ozawaism-without-Ozawa. * In my post yesterday about the Green Wind, I did not acknowledge the association of Green Wind with Die Grünen and other Green parties in Europe. While the association is there, particularly in Green Wind's anti-nuclear stance, the connection of green with wind in a caucus of the House of Councillors is the stronger precedent. The House of Councillors has had the Furyokukai ("Wind-Green-Association") and then the Shinfuryokukai ("New-Wind-Green-Association"). The latter association formed a joint caucus with the DPJ only to be absorbed into it, leaving only the name of the caucus -- The Democratic Party Of Japan and New Wind Green Association Caucus -- as a reminder of the Shinfuryokai's existence. 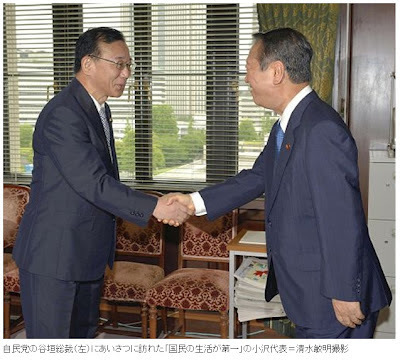 Nakatsugawa Hirosato, a third term Democratic Party of Japan member from the House of Representatives, Tokyo Bloc, has just turned in his resignation papers to Acting President Tarutoko Shinji. He was one of the 19 Representatives who voted against the bill raising the consumption tax to 10% who nevertheless elected to remain inside the DPJ. He is the second of that group to since change his mind and submit a letter of resignation. Which makes little sense, career-wise. True, by voting against the Cabinet, Nakatsukawa guaranteed that the party leadership will not be putting his name on the party list the next time a House of Representatives election is held. Unless he is planning on retiring from politics all together, he has to find either a party to take him (Which is not very likely, for if there were a party in need of him, he would not be coming out as an independent, would he?) or a district where he can run, with campaign funding coming from Amaterasu-knows-where. His reasons for leaving the DPJ are equally peculiar. He attributes his decision to the passage of the consumption tax bill (Which happened, what, 24 days ago?) and the prime minister's not firing Japan's Ambassador to China Niwa Uichiro for Niwa's having tut-tutted about Ishihara Shintaro's plan to have the Tokyo Metropolitan District buy three of the Senkaku Islands. This indicates that Nakatsugawa maybe thinks he has a future in the TMD's or a Tokyo municipality's right wing politics, after his term as a Representative ends. With Nakatsugawa's resignation, the number of Diet members who have resigned from the DPJ since the consumption tax vote now stands at 55 -- 39 from the House of Representatives and 16 from the House of Councillors. It is often the case that something not happening is far more interesting than when something does. What is that is it that has not happened that is so gobsmacking, eye-opening amazing? That since the Ozawa Ichiro breakout of July 2, neither the Noda Cabinet nor the Democratic Party of Japan has won even a percentage point of their popularity back. In fact, the support numbers have gone down. The one tiny point of light in the news is the centimetering up of the percentage of voters willing to plunk down for the DPJ in the proportional vote of a House of Representative election. That the DPJ and the Noda Cabinet have not gained any traction from emerging from beneath the supposedly looming shadow of Ozawa Ichiro made yesterday's resignations of Tanioka Kuniko, Koda Kuniko and Funayama Yasue absolutely unsurprising. All three are district seat holders of the House of Councillors, first termers up for reelection in July of next year (E). All three, need it be said, were Ozawa recruits. Tanioka is the one with the beer glass and the broad grin, standing equidistant between the two big men -- a position she has also occupied in Nagata-cho. That Tanioka has jumped ship finally solves one riddle but poses another. She, Funayama and Koda are joining hands with Kamei Akiko, the daimyo heiress, to form a new parliamentary group, the Green Wind (midori no kaze) which sounds a lot better in the Japanese and hearkens back to the Ryokufukai, the Association of the Green Wind -- the caucus of independents in the first Diet elected under the present constitution. With one more Diet member, either from the House of Councillors or the House of Representatives, Green Wind could apply to be an actual party, attracting both public and private funding. While Tanioka is very well-off and Kamei, being the Tsuwano hanshu's lineal descendant, is probably not hurting for cash, Funayama and Koda were, until their elections, housewives. The latter pair could hardly fund independent reelection campaigns, even with help from Ozawa and Hatoyama. With party backing, however, the pair would likely win reelection. So is Tanioka, who faithfully carried water for both Hatoyama and Ozawa, breaking out on her own? Well of one kind. And only with regrets. And they are not the elections everyone is talking about. Quietly, and without very much fuss, it seems that Ishikawa Yasuo, the disgraced former minister of defense (Mister "I am an amateur in defense issues and that is the epitome of civilian control" to you and me), now secretary-general of the Democratic Party of Japan's House of Councillors delegation, has crafted a simple plan to rectify the disparities in that House that the courts have ruled unconstitutional. The plan has the agreement of the Liberal Democratic Party and the New Komeito and the disappointed acquiescence of the rest of the opposition parties. In contrast with the reform of the House of Representatives districts, which has the various parties talking past one another, the Ishikawa Plan has an excellent chance of being converted into law by the end of this extended regular session of the Diet. The plan is a minimal, hair-splitting solution to the Supreme Court-mandated reform of the disparities in the House of Councillors. Kanagawa Prefecture, which currently suffers from the fewest Senators per capita, will be bounced from six senators to eight. Osaka Prefecture, which is the next in line in terms of underrepresentation, will be similarly bounced from six to eight. To supply these four new Senate seats, someone will have to give up seats. Those someones will be Fukushima Prefecture (great timing!) and Gifu Prefecture, both of which will drop from four senators to just two. While the Ishikawa Plan seems unremarkable for what it contains, what it does not contain makes it interesting. Gone, for example, is any hint of the DPJ's manifesto promise to cut 40 seats from the House of Councillors. This is a huge concession on the part of Ishikawa, a reputed Ozawa Ichiro toady. Also absent from the plan is any hint of an attempt to accommodate the New Komeito Party's and the Democratic Socialist Party's desires to replace the d'Hondt proportional seat distribution system with the Additional Member System. The minor parties have been asked to wait to have their desires answered prior to the 2016 electoral cycle, ostensibly in order give everyone time to think about the proposal. In the absence honoring the promises of massive seat cuts made in the DPJ's 2009 manifesto, reform of the House of Councillors was always relatively simple. This is due in part to the greater level of disparity allowed -- 4.99 to 1 as opposed to 1.99 to 1, the standard set by the Supreme Court for the House of Representatives districts. Another contributing factor is, perversely, the knowledge that the House of Councillors had all the constitutional sense wrung out of it decades ago. Designed to be friendly to independents, and thus a brake on party mob rule, it became partisan battleground through the 1982 introduction of the awarding of proportional seats from party lists. The takeover of the House by parties failed to upend the relationship between the two Houses thanks to the persistence of the 1955 System, whereby the LDP retained dominance in the House of Representatives and the country and the Socialist Party played the part of an opposition while being the dominant party's tacit accommodators. However, in the 1990s the concorde collapsed, half after the breakup of the LDP in 1993 and half in the Socialists' committing ideological suicide from 1994 onward. The person who really cracked the nut, however, was, unsurprisingly, Ozawa Ichiro. First through the New Frontier Party and then later through the DPJ, Ozawa capitalized on the perversion of the the House of Councillors' original purpose and status to make it, and not the House of Representatives, the fulcrum point in politics. That the minority parliament in the Diet can now, through control of the House of Councillors, hold the rest of the apparatus of government hostage, was never the intent of the writers of the Constitution. The Ishikawa Plan's meagre reforms will make no dent in this anomalous situation. The resolution of the unconstitutionality of the districts in the House of Councillors sets up a huge battle over the reform of the districts of the House of Representatives. It will not be resolved, as the LDP desires, with a simple abolition of the five smallest electoral districts. The DPJ rank-and-file will demand an Armageddon over House of Representatives redistricting. Expect them to get one. Prime Minister Loach is asked, and not politely either, to not forget the suffering of Fukushima Prefecture. In the end I was only able to spend around 15 minutes at the rally, capturing a few crowd shots and the beginnings of one of the three marches out of the park. I never got near the main stage. - the organizers claimed 170,000 demonstrators at the rally; the police estimate 75,000. I presume the real number was somewhere near the midpoint. I was at the rally -- but only for 15 minutes. The main assembly area is also a major thoroughfare from Shibuya to Yoyogi. Who was attending and who was just transiting? - Union participation was strong (the above image is of the back of a Tokyo metropolitan railway union man). On the 28th of June Japanese Trade Union Confederation (RENGO) chairman Koga Nobuaki warned at a Liberal Democratic Party of Japan event that the support of his organization may be up for grabs. If the unions are free agents, due the DPJ's backtracking on its social welfare promises and the imposition of a rise in the consumption tax, then the party loses not just a big chunk of its base but much of its on-the-ground organizational strength. I might attend, on proliferation and radioactive waste disposal grounds. No one has ever found reasonable solutions to those two problems. Of course, if I were the GE gas turbine division chief or the gas turbine division chief of any of the Heavies, I would require my employees to attend, with the division providing the sushi, beer, non-alcoholic alternatives and mandatory sky-blue tarp. 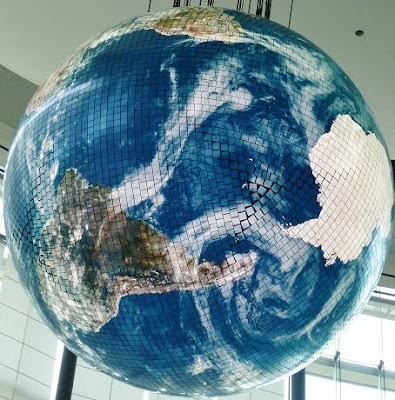 Photo image: the Geo-Cosmos globe at the Miraikan, Koto City, Tokyo Metropolitan District. Yesterday, I had the distinct pleasure of sharing at lunch at Aux Bacchanales with Okumura Jun, my reward for winning a gentlemanly bet with him" over the relative sizes of the anti-nuclear demonstrations on June 29 and July 6. 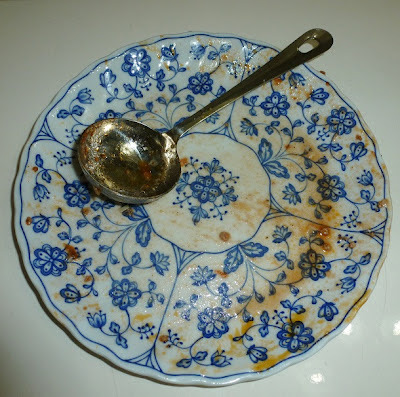 However, I did not dine with a clear conscience. I had a longstanding pledge that I had never made good upon. Back in September of 2007, I pledged to eat my hat if the United Nations Security Council had actually included in one of its resolutions praise for the soon-to-be-expiring Maritime Self Defense Forces refueling mission to the Indian Ocean, a clause included at the insistence of Japanese diplomats in order to undermine the Ozawa Ichiro-led Democratic Party of Japan's refusal to approve an extension of the mission. Incredibly, the story happened to be true. Of course, as we know this sacrifice of Japan's prestige came to naught, as the DPJ-led House of Councillors did not pass the extension legislation by the November 1 expiration date of the previous extension, requiring the LDP to use its supermajority in the House of Representatives to renew the Indian Ocean dispatch in the next year. 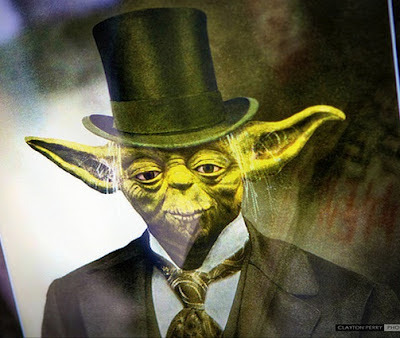 Anyway, I had never consumed my hat, as I had pledged to do. The below concoction is known as a Texas Straw Hat. 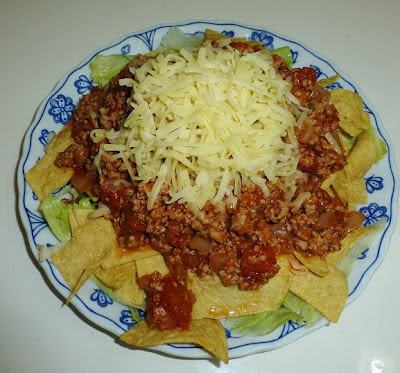 It comprised of ground meat, tomato products, onions, cheese, spices, lettuce and unsalted, plain corn chips. My debt is paid up, my conscience is now clear. Many, many thanks to Okumura-san for the recipe. "An Easter story from Japan"
"Ozawa Ichiro: more shadow than shadow shogun"
"A shadow of a shogun"
In two years, I have graduated from "the writer of a blog" to "a pundit." If keep my temper in check I might someday even have a name. I paid a visit to Kamakura's Tsurugaoka Hashimangu the other day, to check up on the attempts to revive The Tree. I am not sure how the cloning process is progressing (I would guess that it is progressing rather well) but the results of other two methods being employed -- planting a section of the trunk into the ground and encouraging the bare root to send up new shoots -- were less than reassuring. The trunk had only a few lonely leaves poking out from out its bark, while the shoots from the root stock looked far too short and emaciated for two year's worth of effort. Still, the presence of any green at all prompted my traveling companion to shout, "Ganbare icho!" Ginkgos (icho - Gingko biloba) are incredibly tough trees, based upon a design that has remained largely unchanged for over 250 million years. They have numerous strategies for reestablishing themselves after suffering staggering levels of damage. Time and patience may prove my "wistful" farewell premature. A grinning Ozawa Ichiro, leader of the ruling Democratic Party of Japan's splinter party "The People's Livelihood Must Come First" Party (a.k.a. - the "Livelihood Party") paying a courtesy call on the offices of the leading opposition Liberal Democratic Party, shaking the hand of a grinning LDP president Tanigaki Sadakazu. O - "I am Ozawa, leader of the new Livelihood Party. Please look upon us kindly." T - "Tanigaki of the LDP. You are the Anti-Christ." O - "Thank you, thank you. You are the worst president the LDP has ever had." T - "Your policy platform is pure pandering, without a hope of ever being implemented." O - "Your party has no policies at all. You are mere hand puppets of the bureaucracy." T - "When the election comes, your party will be annihilated." O - "When the election comes, your party will be superseded by whatever that pipsqueak Hashimoto Toru cooks up." T - "You call Hashimoto a pipsqueak now, but I know that once this meeting is over you will be on the phone, begging him to repudiate his praise of Prime Minister Noda." O - "I am actually not here to see you. I came here to shake hands with Nobuteru and Tadamori, whom I know have an actual future in your party's leadership." T - "I see you brought your nodding dashboard ornament Shozo with you. If he is such a committed policy wonk, where does he find the time to work on his suntan?" O - "Don't diss him. He's got 5 elections to the Diet." T - "I know. Second in your party to you in terms of Diet experience. Pathetic. You really have no friends, do you?" O - "Permit me to shake hands with your colleagues." T - "Be my guest, panda-hugger." O- "Not the best of times to be using that epithet (E). Anyway, you're the one who refers to his own collected thoughts as "The Analects" (J) and whose grandfather was reassigned from his command in China because he was being too nice to the Chinese (J)." T - "I look forward to our working together." Ishihara Shintaro, the elected, if not actual, governor of the Tokyo Metropolitan District, sure has made himself scarce since the death of the Ueno Zoo's panda cub yesterday morning. I cannot decide whether it is Ishihara's unwisecrack or the significance of panda exchanges to Sino-Japanese relations that had Google News Japan listing the death of the cub among the "Politics" stories all morning long. While Ishihara Senior has been creating headaches for the Noda Cabinet, #1 son Ishihara Nobuteru, the Secretary-General of the Liberal Democratic Party, has been a positive boon for Noda Yoshihiko and his Democratic Party of Japan. "Cannot raise the consumption tax; eliminate the nuclear power plants... Can you protect the people's livelihood this way? Waving the Manifesto the DPJ could not carry out, will they not just go on down the same road the DPJ has come down?" Politician that he is (and long has he enjoyed my appreciation of his dedication to his craft), Ishihara did not rule out working with the Livelihood Party on a no-confidence motion against the Noda government. However, he did say he would do so only following "an exhaustive examination of the situation." On the same day, Ishihara hosted a coming out press conference for former Olympic speed skater Horii Manabu. Horii, a bronze medal winner at the Lillehammer Olympics, has been assigned the role of "assassin" (shikaku) of former prime minister Hatoyama Yukio, challenging him for the Hokkaido #9 seat in the House of Representatives. With Hatoyama the biggest, most pustulent boil on the face of the DPJ, the LDP's selection of a strong candidate to unseat him is like a Christmas gift in July to the prime minister and his party. On paper, upending Hatoyama is a daunting task. He humiliated his 2009 LDP opponent, a former toy company employee (the beauty of the politics of this blessed land...I never have to make anything up), winning 66% of the vote to the LDP candidate's 26%. However, Hatoyama was carried upon the wings of the public's rage against the LDP and Hatoyama's presumptive election as prime minister should the DPJ win and win big. 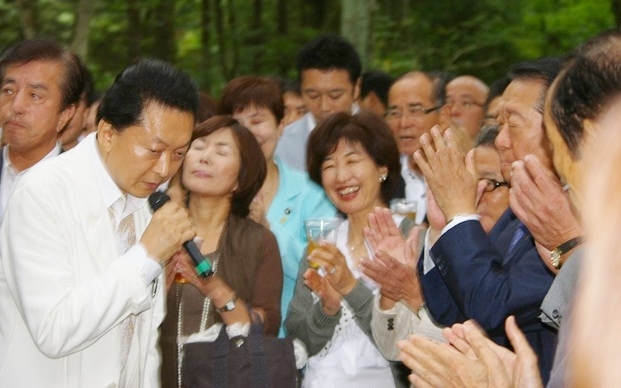 Since August 2009, Hatoyama has only stumbled, embarrassing his constituents. The manner by which he was forced to relinquish his premiership was epic in its combination of hubris, mendacity and blind stupidity. On one visit to his home prefecture, he mused about retiring from politics to take up farming, only to rescind that plan a week later. Hatoyama's constituents would also not be out of place asking the Tokyo transplant: "Excuse us, but what have you done for us lately?" In Horii, the voters would have a chance to vote for someone who actually achieved something in his life, without his wealthy mother having bankrolled it. The helpful Ishihara has also recently positioned himself as the next likely leader of the LDP. He did so by, paradoxically, declaring on July 6 that if current LDP President Tanigaki Sadakazu presented himself as a candidate for the party presidency in September, he, Ishihara, would support him. In the deliciously contrarian world of LDP internal politics, this was a knife in Tanigaki's back. "If there is no dissolution of the Diet, there will be all kinds of folks coming out as candidates. I too may have to think about it." Try thinking that statement through. Think of the counterfactual: the Diet is dissolved, and an election is held. Tanigaki, as the president of the party, leads his forces into electoral battle. If the LDP triumphs, Tanigaki, as the president of the LDP, becomes the presumptive prime minister while Ishihara is rewarded with a reappointment to the position to the post of secretary-general. If the LDP fails to make significant gains, or is indeed wiped out, Tanigaki, if he still has a seat in the Diet, immediately resigns, setting up a leadership election. Ishihara, as the point man on elections, at least according to LDP tradition, follows Tanigaki into disgrace and becomes ineligible for the presidency. So while sounding as though it says something, the statement actually says nothing -- except, of course, silently, "Tanigaki-san, if you cannot push the Noda Cabinet to the wall before the end of the Diet session on September 8, you had better get the heck out of my way." Today is likely to be rough day in Japanese politics. Ozawa Ichiro is going to unveil his new political party, provisionally named "The People's Livelihood Comes First" Party (Michael Penn has provided a very convenient shorthand: "The Livelihood Party"). At this writing, the Livelihood Party will burst onto the scene with 49 Diet members: 37 from the House of Representatives and 12 from the House of Councillors (J). All in all, 51 members of the DPJ have left the fold since July 2. The most recent defector is Yonenaga Harunobu, a Hatoyama Group member, who turned in his resignation papers on July 6. As Yonenaga is a House of Councillors member, his leaving the party over the consumption tax bill prior to the vote on that bill represents an embarrassing loss of face for the Democratic Party of Japan. However, Yonenaga, a district seat holder from Yamanashi, has chosen to serve, at least for now, as an independent, lessening the impact of his departure. It will also surprise no one if the entire membership of the Kizuna shows up at the meeting, with Kizuna leader Uchiyama Akira announcing his party's merger with the Livelihood Party. With Ozawa now out of the DPJ, Kizuna's raison d'être has evaporated. With Kizuna's nine members and the cooperation of Zukeran and the three former DPJ members in Shinto Daichi, Ozawa will have 50 sure votes in the House of Representatives, one short of the 51 he needs to table a no-confidence motion against the Noda Cabinet. Which makes moves of one sure guest at the unveiling unfortunately significant. Former DPJ party leader Hatoyama Yukio has, through his behavior in the last week, transformed himself from DPJ-co-founder-yet-Ozawa-puppet into a DINO - a Democrat In Name Only. On June 26 he voted against the consumption tax bill, for which he was smacked on July 3 with a six-month suspension of party privileges. He complained about this punishment, with some party members suggesting that slapping a 6 month penalty on Hatoyama while hitting other opponents to the bill with two months suspensions was disproportionate. In a gesture that Hatoyama should have accepted graciously, the party central secretariat reduced his suspension to only three months on July 9. "There is an extremely insulting phrase making its way around. 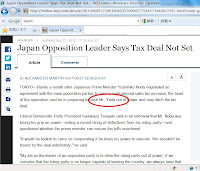 The phrase is 'the LDP's Noda Faction'." Typically gutless in its presentation -- "It's not what I am saying, mind you. 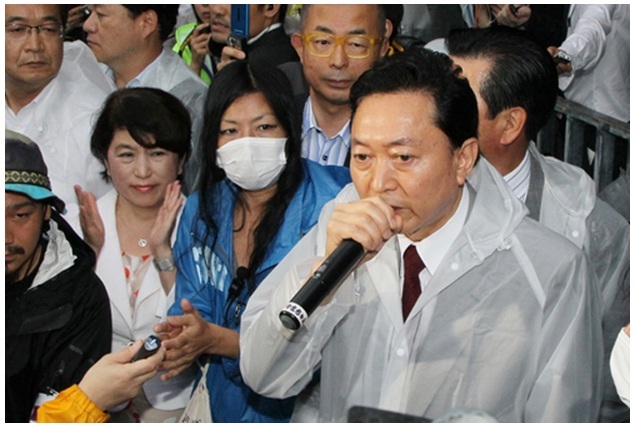 It's what I have heard, that's all" -- Hatoyama's insult is grounds for the imposition of a full year's suspension. Except, of course, doing anything to Hatoyama right now will provide a pretext for him and perhaps a smattering of his followers to leave the DPJ, magnifying the impact of today's unveiling of the Ozawa party. As it is, the leadership will likely sit tight-lipped, seeing whether or not Hatoyama has the wherewithal to actually quit the DPJ. He will be a prominent guest at the unveiling today -- but unless he actually shows up at Secretary-General Koshi'ishi Azuma's office with resignation papers in hand, he is just tossing out his usual b------t, using Harry Frankfurt's definition for the kinds of noises Hatoyama makes. Fukuda received the same two month suspension as the other DPJ members other than Hatoyama who voted against the consumption tax bill. She had, however, voted with the government on the establishment of a national commission to debate the minimum pension and other social welfare programs, while voting down the unneeded bill on the merger of the nation's kindergartens and day care centers - making her one of only two DPJ members to vote this conscientious way. Though only 31 years old, an Ozawa pick and a first-termer, Fukuda is one rebel to whom the DPJ and Prime Minister Noda must pay attention and, if they are smart, total respect. If Fukuda shows up at tonight's unveiling, the indication will be that the DPJ is in serious, serious trouble. * A borrowing of Abba Eban's famous exasperated characterization of his Arab counterparts. Ema (Emma?) LaFleur-Miyazawa, the daughter of former U.S Embassy in Tokyo DCM and later Ambassador to Malaysia Christopher LaFleur and Miyazawa Keiko, the only child of former Prime Minister Miyazawa Kiichi, who along with former prime ministers Yoshida Shigeru and Tanaka Kakuei (pax Kishi Nobusuke and Ikeda Hayato) made modern Japan what it is today, appearing last night on Akashiya Sanma's "Dance, Dance, Dance! Sanma's Palace!" (Odoru Odoru Odoru! Sanma goten!) - a television show so pathetically, egregiously, indescribably bad that the broadcasting of it should be prosecutable offense. Wherever Kiichi-sensei is now, I hope he is in a place without a television -- or if there is one, it was not tuned in to Nihon Terebi last night.